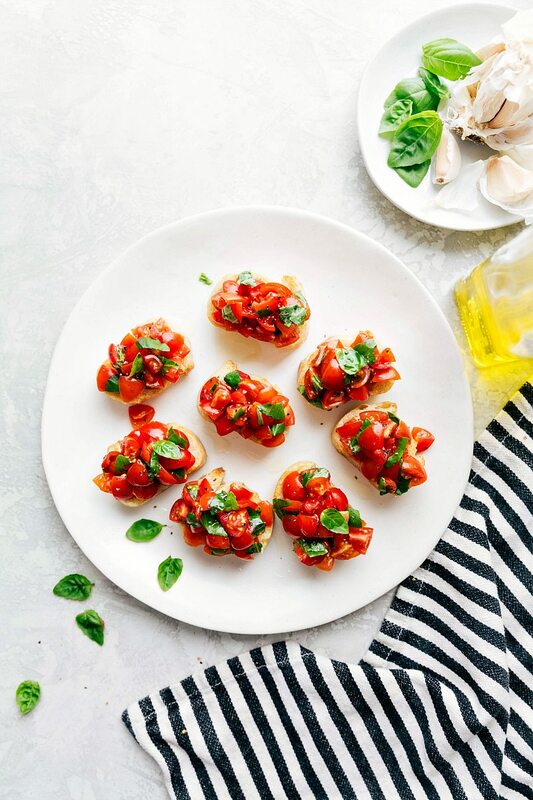 Authentic Italian Bruschetta Al Pomodoro with all the best tips and tricks straight from Italy! If you follow me on Instagram, you might have caught a glimpse of our recent trip to Italy. We were able to visit Venice, Rome, Naples, the Almalfi Coast (Positano, Amalfi, Ravello), Pisa, Siena, Pompeii, and finally Florence. While we were in Italy we took a few local cooking classes and learned to make so many different Italian dishes and desserts. One of the cooking classes (my favorite one!) took place in the countryside near Siena in Le Pietre Vive Farmhouse. The cooking class was in an adorable kitchen surrounded by a large farm, livestock, and tons of olive trees. 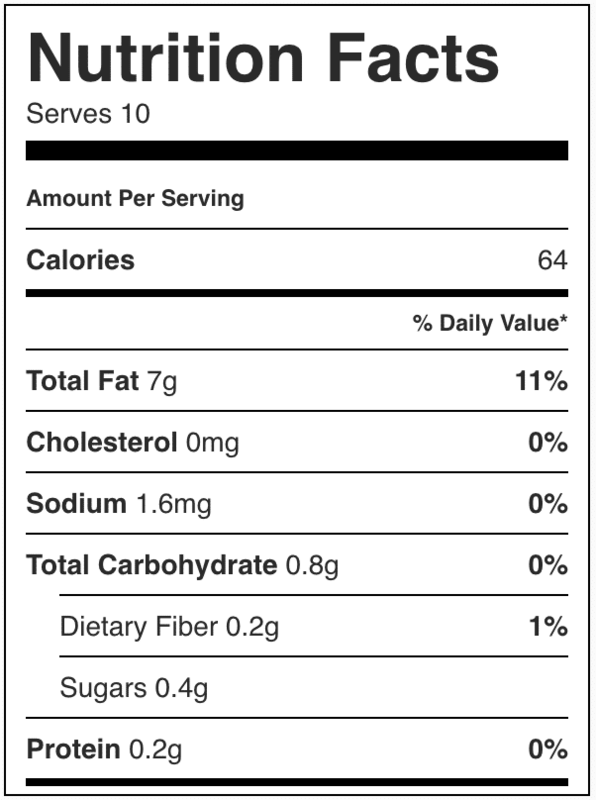 (Most of the ingredients we used were grown/produced right on the farm). Our teacher, Nonna Ciana, couldn’t be a cuter grandma! She spoke little English, but was accompanied by a very entertaining translator. Nonna Ciana taught us how to make a few authentic Italian dishes (and a dessert). We spent nearly 4 hours cooking in her kitchen before sitting down to enjoy the best meal I had while in Italy! For the appetizer, we made three varieties of bruschetta. 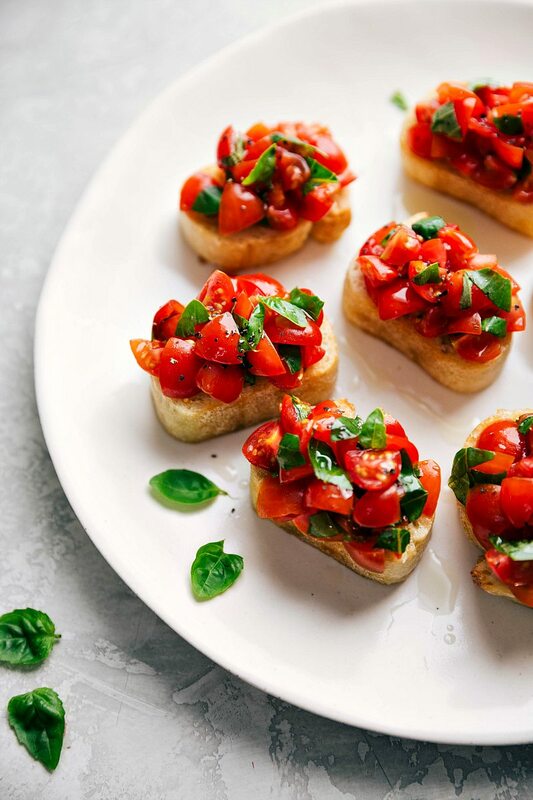 Bruschetta is a classic antipasto (appetizer) originating from Italy that consists of grilled bread, and is topped with ripe tomatoes, fresh basil, garlic, and olive oil. The three different varieties of bruschetta we made were: fett’unta (bruschetta with olive oil), bruschetta with pecorino cheese and chili honey, and bruschetta al pomodoro (bruschetta with tomatoes). All three were absolutely delicious – especially for how simple they were to create – but my favorite was the bruschetta al pomodoro! One thing that I’ve said many times on the blog is that you can make outstanding dishes with just a few really good quality ingredients. You don’t need a hundred ingredients combined with complicated techniques to make delicious food. This idea of a few quality ingredients was emphasized over and over again while I was in Italy; including with Nonna Ciana. Each dish we learned required very few ingredients, but those ingredients were always the best available. Garden fresh and ripe tomatoes, good quality fresh olive oil, fresh real garlic cloves, garden grown basil, etc. For bruschetta with olive oil: grilled/baked slices of bread rubbed with a clove of garlic, topped with extra virgin olive oil, and finished with fresh thyme. 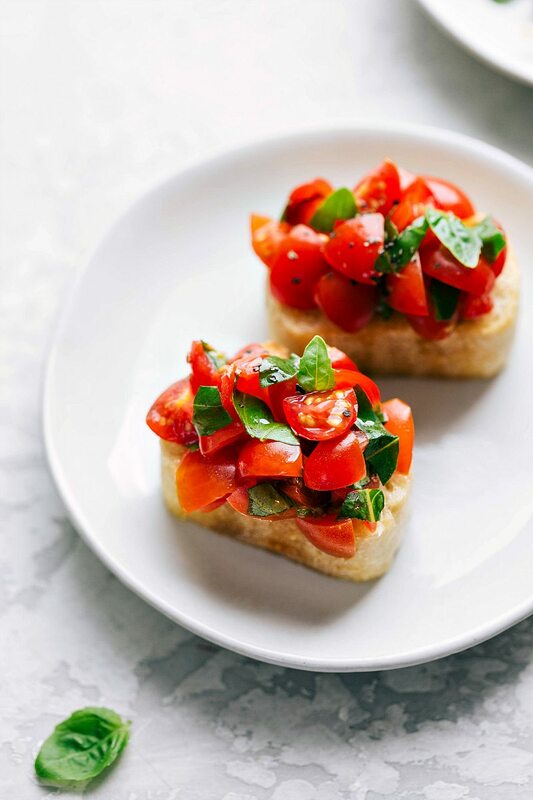 For bruschetta with tomatoes: grilled/baked slices of bread rubbed with a clove of garlic, ripe tomatoes, extra virgin olive oil, salt, and basil leaves. 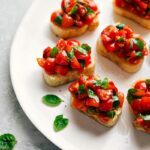 This recipe focuses on bruschetta with tomatoes, but get creative with your own inventions or try some of the others I listed above for a fun appetizer! Prepare the tomato mixture at least an hour in advance to allow the flavors to develop and the juice to drain to the bottom of the bowl. Tear the basil into smaller pieces with your hands instead of cutting with a knife. This will keep the basil fresher and looking bright/vibrant for much longer. The tears don’t need to be perfect, just quickly tear off smallish pieces of basil and add to a bowl. Cut the tomatoes into even-sized pieces as much as possible. Toss together the chopped tomatoes and ripped basil into a bowl and then create a dome in the bowl with the tomatoes and basil. Drizzle the olive oil and salt over it all and don’t stir. Let that stand at room temperature until ready to top the bread. 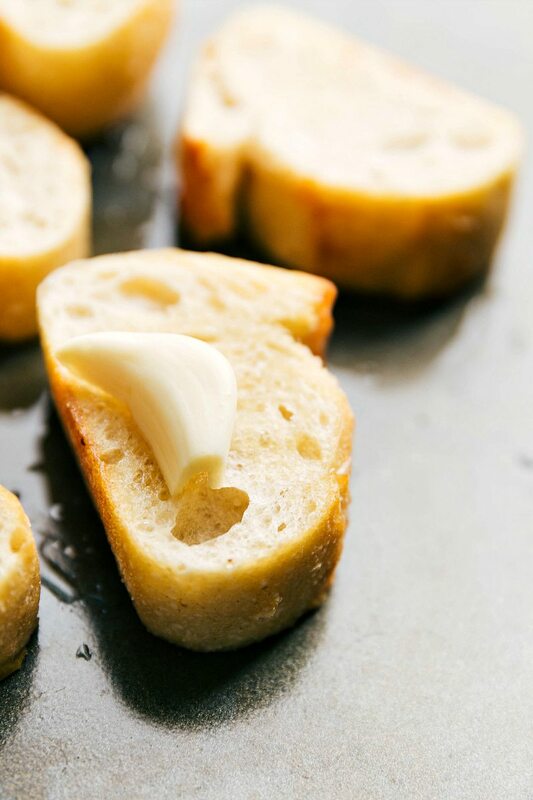 Toast or grill the bread until crisp but not browned and as soon as you remove it from the oven rub the cut side of a garlic clove on BOTH sides of the bread. Drain the accumulated juices from the tomato mixture and put on top of the warm bread right before serving. Authentic Italian Bruschetta with all the best tips and tricks straight from Italy! Start by chopping the tomatoes into even sized pieces and place in a medium sized bowl. With your hands (don't use a knife), rip the basil leaves into small pieces. Gently stir together the tomatoes and basil and then form a dome with the mixture. Slice the bread and then brush 2-3 tablespoons of oil on the tops of the slices. 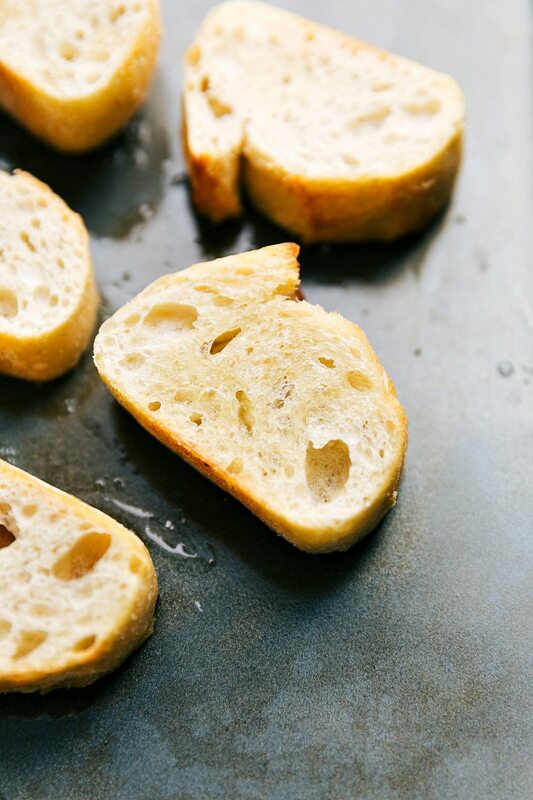 Toast the bread slices on a charcoal grill (oiled side down) until golden-brown and lightly marked with grill lines OR: Set your oven rack about 6 inches from the heat source and preheat the oven's broiler to high. Place bread (oiled side up) on baking sheet and broil for 1-2 minutes (watch carefully) and then remove from the oven. Slice a raw garlic clove in half. Gently rub the grilled slices of bread (both sides) with the cut end of a raw garlic clove. Top each slice with the marinated tomatoes. Add a light drizzle of a bit more of the extra-virgin olive oil, if desired and any additional basil or salt on top. Enjoy immediately while the bread is still slightly warm. I foresee making this often this summer using garden fresh tomatoes! I found it interesting there are different types of bruschetta…I thought it always had tomatoes! hey girl- I would love to visit Italy! 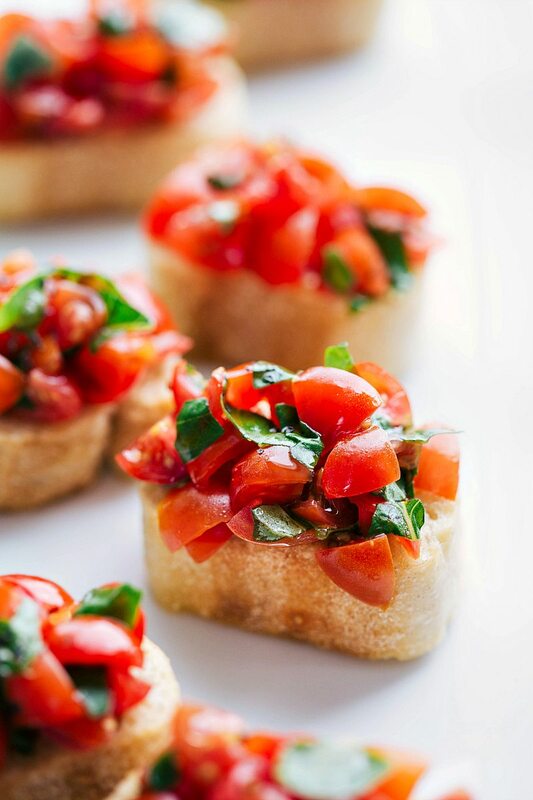 and This bruschetta looks so yummy! These look absolutely delicious! I love your photos. They make me hungry!